Description: Designed with a clean round profile and refined styling, the Cilindro Campbell wall sconce reveals a sophisticated aesthetic. 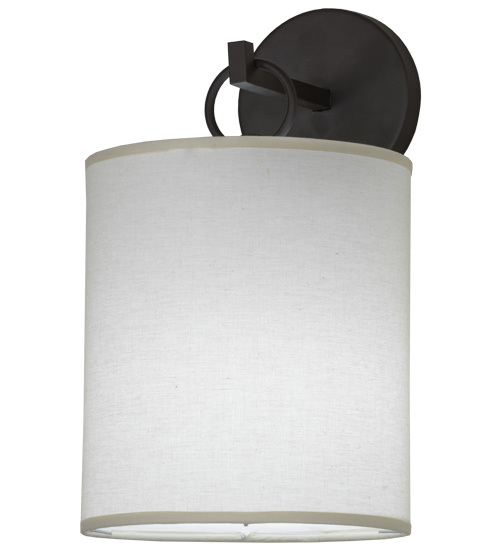 The wall fixture features an Eggshell Textrene shade with a Statuario Idalight bottom diffuser and complemented with Oil Rubbed Bronze finished hardware. A customer-supplied LED lamp delivers energy savings and long lamp life. Handcrafted in the USA, this fixture is available in custom colors, styles and sizes, as well as dimmable energy efficient lamping options. UL and cUL listed for damp and dry locations.